for most of his career and now 2008 marks the 23rd year of the production of the Air Jordan line. 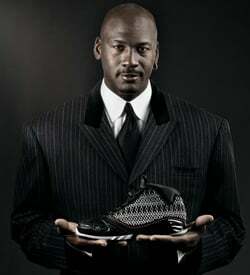 Jordan Brand, Tinker Hatfield and Michael Jordan of course teamed up to release the Air Jordan XX3 (23) shoe. The Air Jordan XX3 will be the first basketball shoe from Nike to embrace the Nike Considered design, where details in the development and design of the shoe seek to reduce waste and allow for use of environmentally preferred materials without comprising the athletic performance. The Nike Considered design ethos is one of the several company-wide corporate responsibilities that Nike Inc. has implemented to sustain long-term growth and innovation. The Air Jordan XX3 is one of the most complex and complicated shoes of its time and much research and development went into the shoe to find the perfect look and feel. Here are some of its features seen in the shoe. An automotive quality painting process was used for the backside of the Thermo Plastic Urethane chassis is completed by an efficient robot arm to maximize the quality, consistency and durability of the paint and component. To help out with the environment, the outsole is composed of environmentally preferred materials that reduces the toxins and uses the Nike grind material from footwear outsole manufacturing waste. One of the most important aspects of the Air Jordan 23 is its exterior and it is composed of many different materials and designs. For the upper, a newly engineered technique that uses a machine to stitch the upper in 3-D form was implemented into design. A very important aspect of the shoe is its high comfort level; a dual density sock liner offers full comfort while the recovery foam around the heel conforms to foot shapes to create a more custom fit. The reinforced quarter panels from and holds the exact shape and the breathable tongue allows air to escape, which keeps the foot cooler. The same ingenuity and effort that went into the upper can be seen in the mid-sole/outsole. A full length Zoom Air sole unit was used to provide superior cushioning. Another noticeable feature is how light the shoe feels. Weighing in only at 15 ounces, the lightness of the shoe increases the agility and stability. The Air Jordan XX3 features some unique designs that add that special touch to the shoe. An imprint of Michael Jordan’s fingerprint is seen as the pattern on the outsole. More of Michael Jordan went into the shoe besides his fingerprint; his signature can be seen on the toecap, a nice touch added to the shoe. The handcrafted MJ stitch pattern offers beautiful detailing and function. 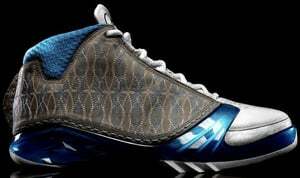 An exclusive limited release of the Air Jordan XX3 will launch on Friday, January 25, 2008 with a suggested price of $230. An All-Star release will launch on Saturday February 16, 2008 with a suggested retail price of $185. The nationwide launch will be released on Saturday, February 23, 2008 with a suggested retail price of $185. Retailer information can be found at Jumpman23.com.